After the wonderful exploits of Jago & Litefoot in the late 1960s (see my Series 5 review) we return to more familiar territory with Victorian England, Ellie the barmaid and Sgt Quick; yes it’s Jago & Litefoot Series 6. Have our heroes been altered by their experiences on-board the TARDIS and in the twentieth century? Who is the mysterious Colonel who was waiting for them to re-appear? Some of these question might be answered below, some will not. What you can be assured of is a four discs of jolly japery and magnificent malefications in the company of Messrs Jago & Litefoot! 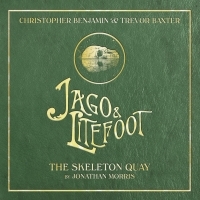 Jonathan Morris kicked off the series with The Skeleton Quay. On arriving back in London at the end of Series 5 there is no pause for breath as the mysterious Colonel introduces himself. We learn that he is an agent of non other than Queen Victoria who wishes to have Jago & Litefoot investigate mysterious ghostly happenings on the Suffolk coast. They leave London by train; on the journey Jago sleeps leaving Professor Litefoot to make the acquaintance of Camilla Tevelyan (Francesca Hunt – India Fisher’s sister) who owns the local docks. As the story progresses we learn that memories of travel in the TARDIS and of the 1960s are fading; we also learn of the local village washed away in a storm and whose inhabitants are now skeletons! All this along with mysterious comings and goings, pirate tunnels and the local fisherman Isaac Pawley (Keith Bartlett). This is possibly the strongest story of the set with a good plot and it also presents a scientific explanation for the skeletons that appear in the ghostly village. It also sets a theme of introducing a new, well-defined female character at the start of the story. Next up we have Matthew Sweet’s Return of the Repressed. I have to admit to not liking this story at all – this is not particularly a reflection on the writer who has such titles as The Magic Mousetrap to his credit and wrote for Jago & Litefoot in series 4 (The Lonely Clock a story I liked as I said here). This story, though, failed for me; it is about Jago spending time being analysed by Sigmund Freud due to his nightmares. Throughout the story we have increasingly erratic behaviour from both central characters and lots of back-story for Litefoot. I struggled to get to the end of this and fortunately it adds nothing to the overall arc of the series. There is a good story to be told about meeting Freud and the idea that this could be triggered by nightmares connected to suppressed memories from time travel (for example) works for me. This doesn’t. The pace picks up in George Mann’s Military Intelligence. 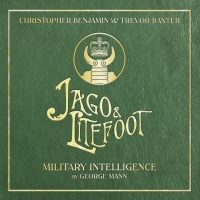 I particularly like the fact that Jago & Litefoot realise early that the Colonel may not be all he claims, something very obvious to the listener. We also get another leading lady appear in the form of Agatha played by Nancy Carroll. Not only that but we return to familiar ground with the re-appearance of Ellie and Sgt Quick. The story quickly reveals that the Colonel is working on an army of automata controlled by Babbage Engines and wants help from Jago & Litefoot as they dealt with Tulp’s ventures in this direction back in series 1. This is a particularly steampunk story and it works be separating the main characters and putting Litefoot in imminent danger. Agatha is revealed as a true agent of the Queen and with Jago and Ellie they set out on a rescue mission that doesn’t end as well as it might. The final tale (as is usual) is told by Justin Richards. 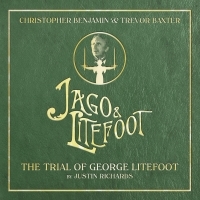 In The Trial of George Litefoot we start with Sgt Quick arresting Litefoot for the murder of Jago! We learn that Jago is alive and well and working with Angela to get the evidence to arrest the Colonel and undo his plans. 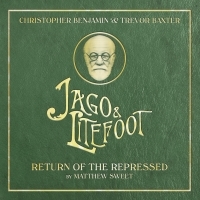 Litefoot goes in trial for the murder and amusingly his defence counsel is in fact Jago playing a lawyer. Lots of amusement before the denouement which I won’t spoil but will just admire. The plot moves back to an observatory from which the Colonel aims to fire a projectile to kill the Queen and for which Jago & Litefoot will take the blame. Jago saves the day but everyone who knew the truth gets killed leaving Jago & Litefoot on the run and heading for series 7! I have some gripes though not many. Why was the Colonel waiting for Jago & Litefoot at the exact point they returned from the 1960s and why do they have to forget? We know Litefoot will brief Ellie one day to some extent but for now this seems a little incongruous though does simplify story telling. Ellie was much less used than normal – have the writers no more ideas for her? The overall concept was good thought I would have preferred a different second story that built the relationship with the Colonel. Apart from that all the boxes were ticked, plenty of action and a good scene setter for the next series. 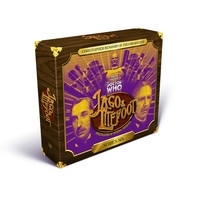 Is Jago & Litefoot Steampunk (or indeed Doctor Who itself)?